My wife recently bought a horse, and she needed a tote for carrying around horse care items like brushes and spray bottles. This would be something that would be used in a horse barn, a rough, dirty environment. It would have to survive being crammed into a tack closet, set down on a mucky floor, kicked, and stepped on. Obviously not a fine piece. 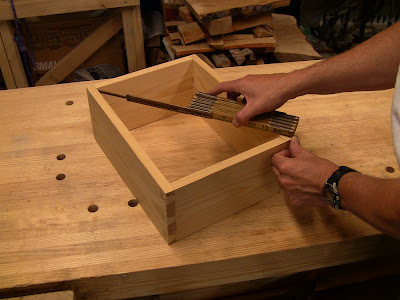 A simple square-sided rectangular tote with center handle, similar to a carpenter's tool tote, would suffice. 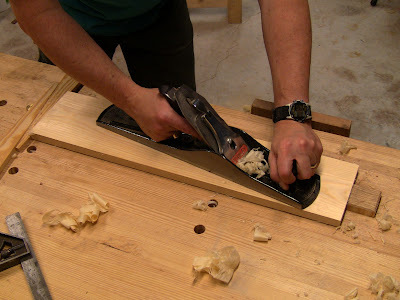 I decided this would be a good time to try out the dovetail method Frank Klausz describes in Hand Tool Essentials, "The Final Word on Dovetails". This is a pins-first shoot-from-the-hip method, no layout. 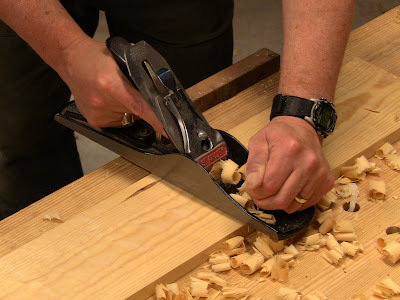 So I bought some pine 1x6 at the home center and performed basic stock preparation in the FEWTEL sequence. 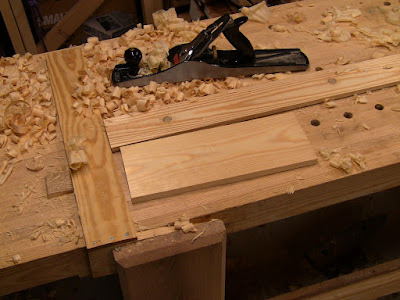 Breaking down the boards to rough lengths, working around the knots. Face: planing the reference face flat with a #6. Edge: jointing the reference edge 90 degrees to the face with the #6. 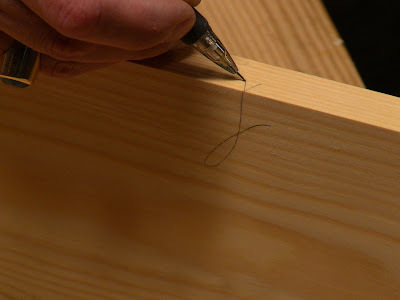 Marking the jointed edge, meeting up with the face mark. This arris will be the inside bottom corner on each piece. 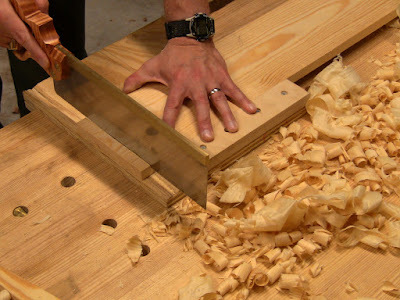 Width: I'm using the lumber at its dimensioned width, so no need to rip or joint it. But I want to take the stock down to 5/8" to reduce the weight. Gauging the edge all around. Thickness: traversing with a #5 using a cambered iron set rank. Flattening the reduced face with the #6. End: trimming the rough-cut end for a clean cut, followed by shooting the end grain clean. Length: after cutting to length just shy of the line, shooting the end grain with the #6 to bring it down to exact length, perfectly square. An alternate work-holding setup for the shorter end pieces. 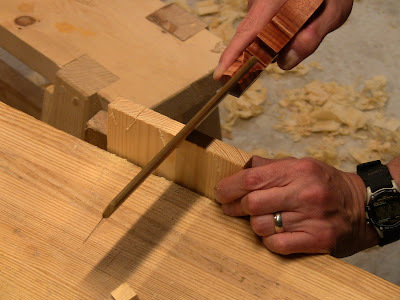 The work piece is completely loose here, restrained in two directions by battens. 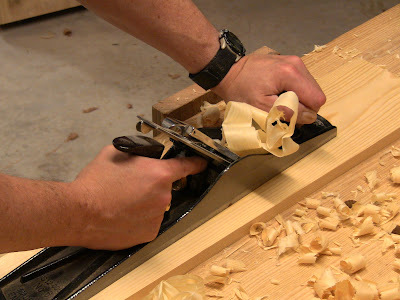 Planing is done against one batten or the other on a slight diagonal, so the remaining batten keeps the piece from sliding around. 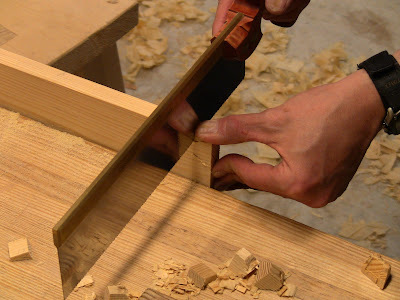 The left batten is held in the vise and backed up by the planing stop; the edge can be tipped up at various angles for working thicker stock. 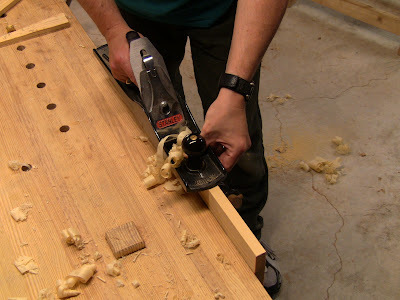 The long rear batten has short 3/4" dowels glued in; these fit into dog holes drilled into the benchtop for this purpose. 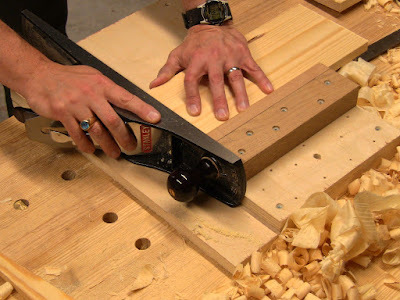 A second pair of holes allows the batten to be moved back another 6" for wider pieces (use the batten itself as the template for the holes before gluing in the dowels). This is a versatile setup that allows quick changing of pieces of various dimension. 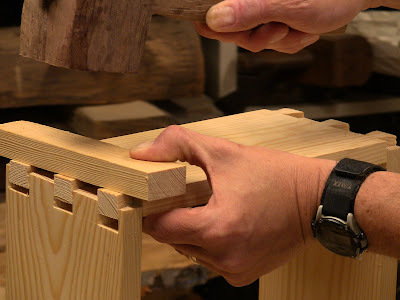 Next step was Frank's method for the dovetail pins (defining three tails) on one of the sides. 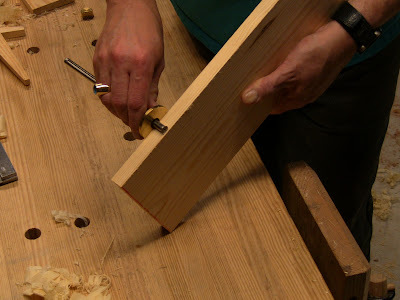 First, I gauged all around the end, marking a baseline equal to the thickness off the matching piece plus a hair. The rest is all by eye, just do what looks pleasing. 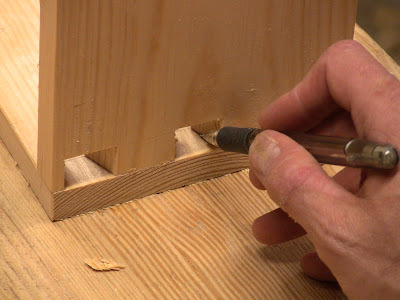 Make oppositely-angled cuts straight down at each end, then the next inside pin cut at the right end, parallel to the one at the left end. This defines the right-most tail shape. 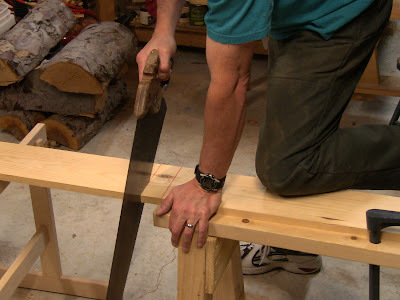 Then make another parallel cut splitting the difference, shown here. 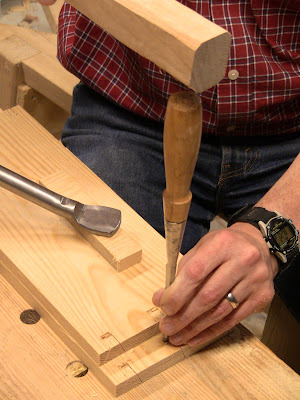 Finally, make the oppositely-angled cuts to define the remaining two pins. Repeat for all four corners. After marking the waste pieces with X's (don't want to chisel off the wrong part! ), chiseling them out. Chris Schwarz calls this method "beavering out", alternately straight down and then angled in, halfway on one side and then flipping the pieces and completing from the other side. Note the high-tech light-duty mallet: a pretty chunk of firewood rescued from the pile and shaved down. Transferring the lines to the tail pieces. Remember that the tails spread OUT! 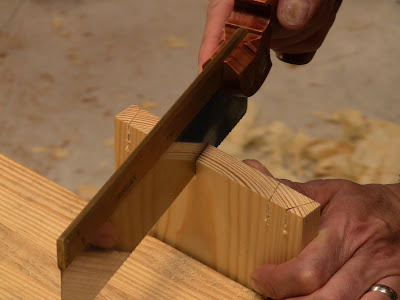 Cutting the tails: straight across, angled down, just to the waste side of the lines. Trimming off the half-pin end waste next to the first tail, followed by beavering out the waste between the tails. Repeat for all four corners. There followed a fidgety period of fitting the matching corners together, paring the tails to straighten up their sides and fit snugly. Unfortuntely, this caused some of the thin tail tips to crumble a bit. Agh! That's what I get for using softwood. I was impressed with how solid it was without any glue. So I decided to do a little stress test. 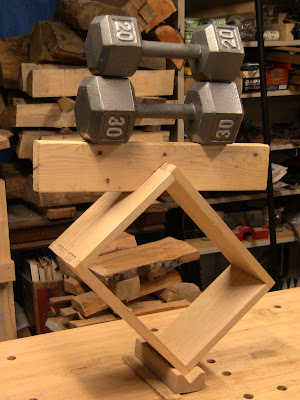 Ever do that project in junior high school where you build a model wooden bridge and then load it with weights to see how much it holds before collapsing? Not-Koyaanisqatsi: making good use of my V-blocks. 50 lbs of iron dumbbells in compressive load on the diagonal, not a groan, nothing budging. Ok, don't push your luck. Take the shot before it falls over! Testing for square after the load: both diagonals match. Everything stayed good and tight with no racking. Nice one, Frank! Of course, his sample in the book looked a lot cleaner than mine. How many thousand has he done? Next will be grooving for the bottom and fitting the handle before final assembly.